Seventeen European Parliament members from all across the political spectrum are opposing their leftist colleagues' initiative, which would invite family members of convicted terrorists to the Parliament building. In a letter to the European Parliament President Antonio Tajani, the signatories wrote, "We are utterly appalled at the understanding that our colleagues from the Delegation for Relations with Palestine (DPAL), under the pretext of discussing 'the situation of the Palestinian prisoners in Israeli jails after the hunger-strike,' are in fact offering a public platform to relatives of convicted terrorists." "We, Members of the European Parliament, are seriously concerned with the message this forum sends to our constituencies amidst such turbulent times in Europe. "Given that the Israeli-Palestinian conflict involves a wide range of issues, we encourage our colleagues, who choose to show their support for the Palestinian self-determination, to engage with Palestinians pursuing peace, and not with convicted terrorists." According to the signatories, the hearing's organizers are blatantly ignoring "the Council Decision listing both the Popular Front for Liberation of Palestine (PLPF) and the Al Aqsa Martyrs Brigade as terrorist organisations." The letter, which was sent by Europe Israel Public Affairs (EIPA) President and Swedish MEP Lars Adaktusson, comes just prior to a Strasbourg of Members of the European Parliament meeting with DPAL and their kin-of-terrorist guests. DPAL's planned guests include Fadwa Barghouti, the wife of archterrorist Marwan Barghouti, and Sudmoud Saadat, daughter of Ahmed Saadat. 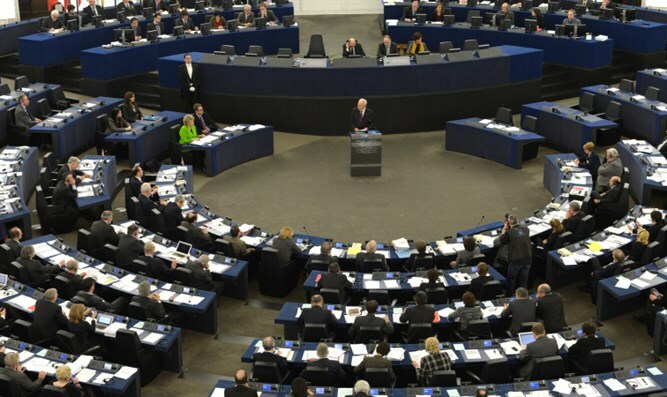 "With a newly formed Committee on Counterterrorism, the European Parliament should vehemently enforce its rejection of any form of incitement and hate speech, and discipline its members who are offering an official platform to PFLP and Al Aqsa Martyrs’ Brigade affiliates; such actions undermine the very core of European values and norms," said Teodora Coptil, who heads relations with the EU Institutions at EIPA. EIPA Founder Rabbi Menachem Margolin said, "Can you imagine what the reaction would be had the family of Osama Bin Laden would be invited to the European Parliament to express the motivation and supposed rationale of their terrorist relative? It is unthinkable." "Yet this is precisely what the Delegation for Palestine sought to do. We welcome the MEPs initiative to quickly move and raise their objections at this abhorrent move. It is now up to the President to ensure that this doesn't happen."